I remember when I was growing up my mom, brother, and I would make monster mouths every Halloween. They are such a fun and nostalgic treat for me! Although my boys cannot have them prepared this way (they are both allergic to nuts) our daughter can and so her and I make the “original” ones together. 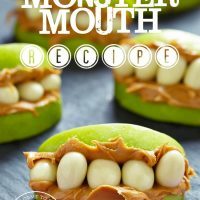 We modify these treats for the boys by using either: cream cheese, yogurt, or frosting for the filling instead of the peanut butter. 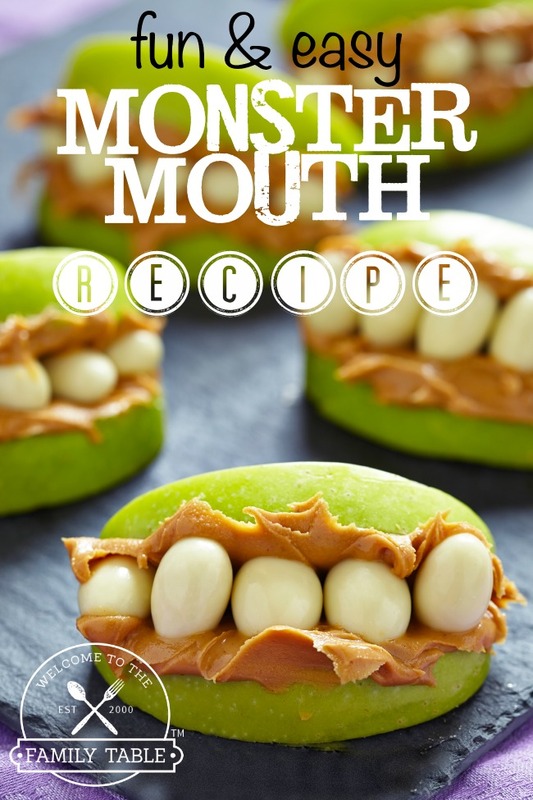 In addition to a fun everyday snack, this simple and fun is a great one to add to your Halloween party and monster-themed birthday party. 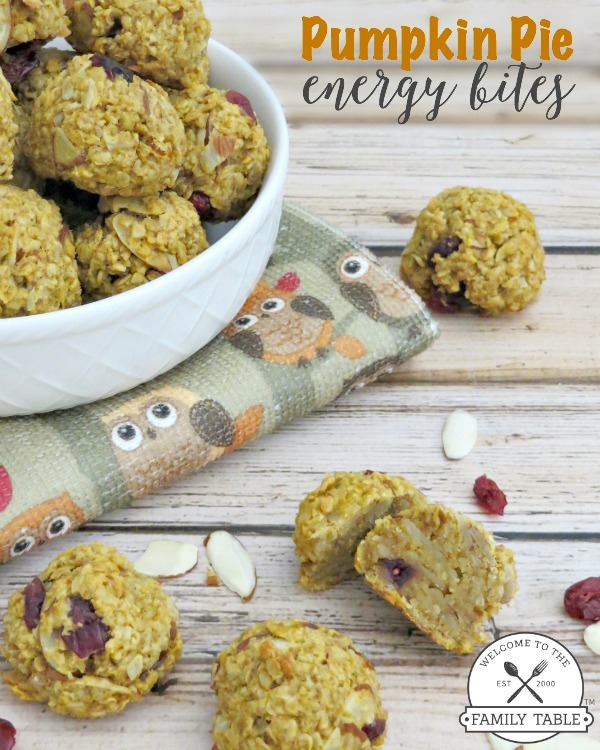 This fun and easy recipe is the perfect way to connect with your kids in the kitchen. Enjoy! Clean, core, and cut apples into 8 slices. Use approximately 1 tablespoon of peanut butter to “glue” the apples together. Use approximately 1 tablespoon of peanut butter to "glue" the apples together. I am so glad you like them, Leigh! I hope your kiddos love them 🙂 Have fun! These are very cute! Can’t wait to try it. Just a thought…as neat as it is that you and your daughter share this, could you try sun butter so your boys don’t miss out on the tradition? Hi Kelly! 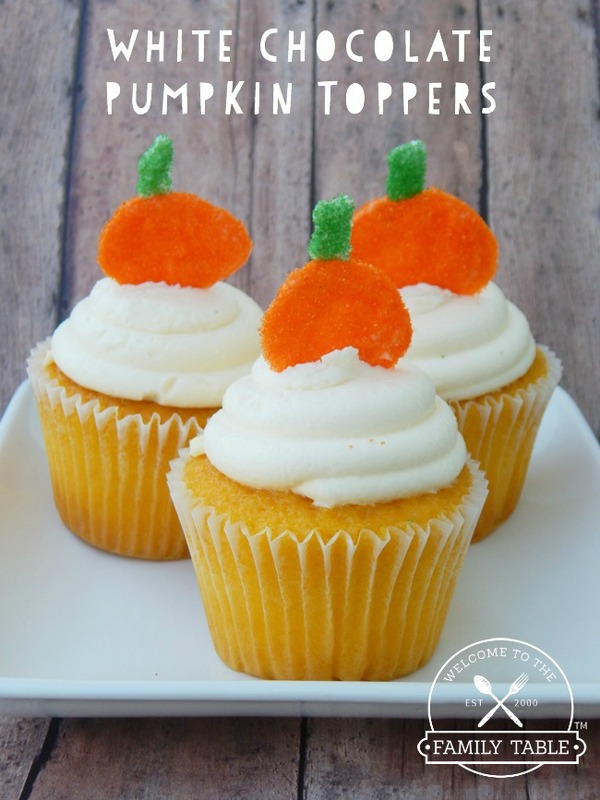 Thank you so much for your thoughtful comment about my boys 🙂 I should have probably mentioned in the post that we do a “modified” version of these for the boys – we will use either cream cheese, frosting, or yogurt. I am going to add this to the post as I am sure others could benefit from the suggestions. Thank you again for stopping by, you are so kind!